Social media is at the forefront of a successful marketing strategy for promoting your book. 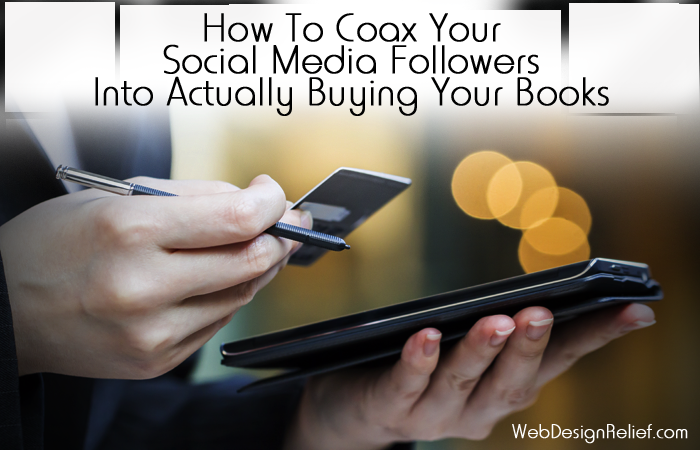 But having thousands of fans on Facebook, Twitter, Instagram, or Pinterest doesn’t always lead to thousands of book sales during that all-important first week of release. Thanks to algorithm changes, the organic reach has plummeted on Facebook this past year. And Twitter can seem like a noisy cocktail party where readers just aren’t listening to what you have to say. But writers who try to counteract these trends and build sales by repeatedly posting and tweeting “Buy My Book!” will appear rude, pushy, and lose social media followers fast. So How Can A Writer Effectively Convert Fans Into Customers? It’s All About Your Readership. Gaining social media followers on any platform takes time and effort—but building your following is the essential first step. There are companies that offer so-called quick fixes (“10,000 Twitter Followers In Ten Minutes!”), but be forewarned: Publishing industry influencers can spot these fake friends from a mile away. It’s better to gain readers authentically and organically rather than to plump the numbers with barely interested strangers. Respond to comments, develop relationships with your readership, and only mention your book is for sale in one post out of every ten. If you have real fans following you, they’ll be more likely to become your customers. Keep an eye on the Insights data of your Facebook Author Page. If a post is getting a lot of attention, consider promoting it to expand your fan base. If a tweet is being retweeted often, consider pinning it to the top of your profile so it’s the first thing readers see when they check you out. Set up an Author Central account with Amazon, where authors can access Nielsen BookScan sales numbers to track book sales nationwide, including bumps from your promotion efforts. If you become an Amazon Affiliate, you can add special sorting tags to the links to your book page in order to track which social media platform converts the most fans into customers. Convert Social Media Followers With A Mailing List. Building a healthy, targeted mailing list is the number one way to convert your readership into book-buying customers. Social media venues can change policies at any time, but if you can convert those fans into subscribers, you’ll have a captive audience. Make sure that the sign-up to your mailing list is featured on every page of your website and also at the top of your Facebook Author Page. Self-published authors: Consider offering a free eBook from your backlist, preferably the first in a series, which can be downloaded and then side-loaded onto the reader’s device. Run a contest for readers that requires an email sign-up for entry. Offer otherwise-unavailable direct content like a short story, spin-off novella, or a yummy recipe to tempt fans to subscribe. Do a monthly drawing exclusively for fans on your email list. In the days leading up to the drawing, post on your social media accounts that followers must sign up with their email address to be included in the drawing. Your Fans Want You To Succeed. You’re putting a lot of time, energy, and talent into converting your readership, so don’t hesitate to throw out a call to action now and again, whether you’re promoting a sale, a freebie, or just asking for readers to subscribe. If you’ve won their hearts, they’ll buy your books—and they’ll tell their friends to do the same. QUESTION: Where do you hang out the most—Facebook, Twitter, Pinterest, Instagram, or another social media site? Thank you for this, I am struggling with the whole concept of using Social Media to publicise my book. As for garnering fans seems a major pipe dream.. On a steep learning curve, but my first novel and I hadn’t thought about the after the writing! Food for thought….S. Since I have no books, I can still ask for followers to sign up for my e-mail list? I do need to build an e-mail list for when I finish my memoir about attending college as a mother of five. Thank you for sharing your knowledge with your readers/followers. It is greatly appreciated. Victoria, You most certainly can! If you write in other mediums (poetry, short stories) you can always update your subscribers about that. If not, you can always update your subscribers about your daily/weekly writing life and career.